Some days the tail really does seem to wag the dog. That is to say a small thing has power over, even drives the greater, larger whole. When I notice this tail wagging condition, I want to reboot and set things right. Get on top of my circumstances. Take control. Take charge. Right a wrong. Because in my world, when I am pushed through by the tyrannical urgent, I miss the ordinary. Welcome to day four. To read the days of noticing leading up to today, click here. I am joining the nester for her 31 Day Challenge. This is 31 days of noticing. Many days I start with the words of Oswald Chambers. For years I have read “My Utmost For His Highest”. Rarely do I recognize a daily reading that I have already read. Sometimes the familiar rings. But the context in my day is always fresh. And I find myself sitting still, steadying my gaze on the page, letting his words drift into the folds of my soul. Enjoy your weekend friends. Thanks for being here on this journey. Your presence is a fragrant offering. I, a writer, have a bit of difficulty expressing what your comments add to this journey. Let’s say they sing to me during my day. The notes swirl around the busy or the mundane and offer me blessing and encouragement. And when you read here, that alone is an offering. Your presence, it is noticed. Listen to the words of Oswald Chambers as you prepare your hearts for your journey into noticing this weekend. The New Testament notices things which from our standards do not seem to count. ‘Blessed are the poor in spirit,’ literally – Blessed are the paupers – an exceedingly commonplace thing! The preaching of to-day is apt to emphasize strength of will, beauty of charachter – the things that are easily noticed. I walked into Publix this week and spotted these delightful little pumpkins in a beautiful pile of autumnal glory. I starred. As if I were in a gallery. I studied, as if I were in a library. And I glazed over, into the moment of intentional choosing. Which ones would I joyfully bring home. Small moments light me up. I can hold them for forever. The remembering intensifies the pleasure. 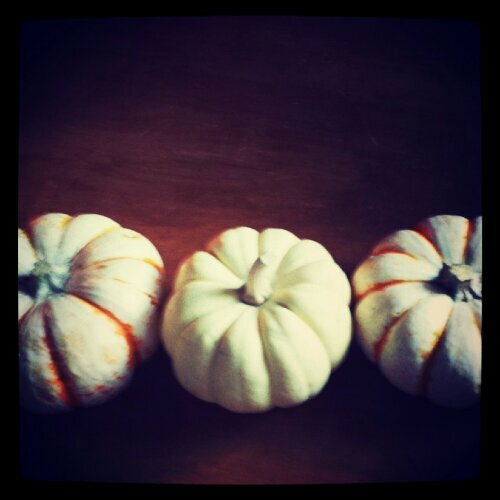 These three little pumpkins have taken me into small moments, ordinary, transformed though into artful extraordinary. Where is the God-beauty waiting in your day? What small poetic discovery is waiting for you? Ready, set, go notice. I’ve enjoyed and been inspired by your series thus far. My 2 &1/2 months great-grandaughter (Skye) was buried Sept. 30th and I’ve needed your guidance which you’ve shared, unknowingly. I know that there are so many others benefitting from your thoughts. That little life has touched our family in a death from SIDS as only God could. I thank Him and you. so true! love this post, and your pumpkins also, have been thinking I need some for my front porch. I noticed the trees turning colors. One tree, multiple branches with their leaves all turning on their on time. Some are orange, some are golden, some are brown with a touch of green. Coming from the Master Tree–all at different stages of turning. Just like God…our Tree of Life boldly watching in patient stillness as we the branches all turn our own shade/color of Fall in our own time. He is not concerned or worried that we aren’t all at the same stage in color change. We are all beautiful! Ecclesiastes 3:11: He has made everything beautiful in its time. And James 1:4: But let patience have its perfect work, that you may be perfect & complete, lacking nothing. So I notice the stages of the branches with their leaves turning colors & am reminded I don’t need to compare beauty or works because I/we are all turning & developing at our own time! Yes…yes…let’s live on purpose! Let’s pay attention! Your challenge and cry resonants within me, to do this very thing! It’s a song I often sing to myself because I am so apt to forget. Your heart is a precious one. Dear Elizabeth, friend, I am amazed by the similarities here in our journeys. The poetry of pumpkins, the way when “pushed through by the tyrannical urgent, I miss the ordinary.” I just don’t want to miss the everyday moments either. I love this: “I stared. As if I were in a gallery. I studied, as if I were in a library. And I glazed over, into the moment of intentional choosing.” Amen! How I wish we could sit face to face and talk about this life. Sending much love!